Let’s face it. Storage vendors aren’t nonprofits. They need to make a return for their investors just like any other company. They cannot provide that return if their revenue streams don’t grow. And they can’t make their revenue streams grow unless they deliver what their customers demand (or more). The storage layer of the data center stack is fundamental to application performance and hence can be a significant bottleneck in the form of I/O latency and throughput constriction. To deliver higher performance storage systems, the overwhelming strategy of (nearly) all storage vendors in the past has been to incorporate the newest, fastest, most expensive persistent media technology in their product lines. Historically, that media has been spinning disks. Architectures varied by size, capacity, feature set, etc., but persistent media was stratified into various speed HDDs – from low cost, high capacity 7.2K RPM to high cost, low capacity 15K RPM HDDs. As applications demanded better performance, the consumer electronics market enabled production of a lower latency, lower capacity, persistent storage technology in the form of very expensive Solid State Drives (Flash). Rather than do the hard work of developing an architecture that sensibly used SSDs to deliver higher performance while reducing the overall cost of storage, vendors followed their old playbook. Within a very short time, SSDs replaced 15K HDDs for 100% of the persistent storage layer in their products – driving production costs up significantly and passing that cost through to their customers. The more things change, the more they stay the same. Customers, however, are experiencing new performance demands and eroding IT budgets, coupled with increased capacity requirements. In the Dell EMC whitepaper referenced above, the claim is made that SSDs have reached the cost inflection point where their capacity is the same or lower cost than HDDs. No supporting evidence or detail is given for this assertion. The fact is, while the declining price per GB of SSDs vs. HDDs has accelerated, both media types continue to develop denser drives. 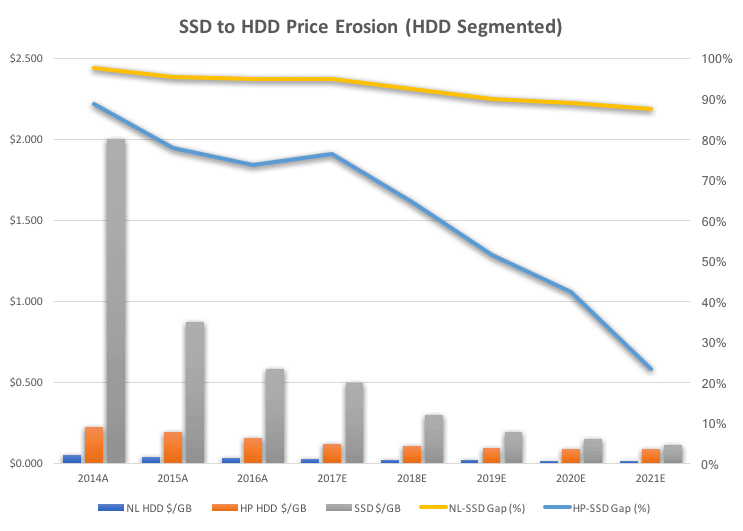 Add to this that the starting price gap was initially on the order of 20X or more and HDDs continue to be much less expensive than their solid-state counterparts and will be into the foreseeable future. The following two charts illustrate this gap. industry pundits have made the simplistic assumption that they can only be compared to the highest priced, lowest density HDD class – 15K RPM drives (which they all stopped using when switching to all flash). Their reasoning has been that no vendor could compete performance-wise with SSD latency while primarily using High-Density Slow Rotation (HDSR,7.2K RPM near-line SAS) drives in their arrays. 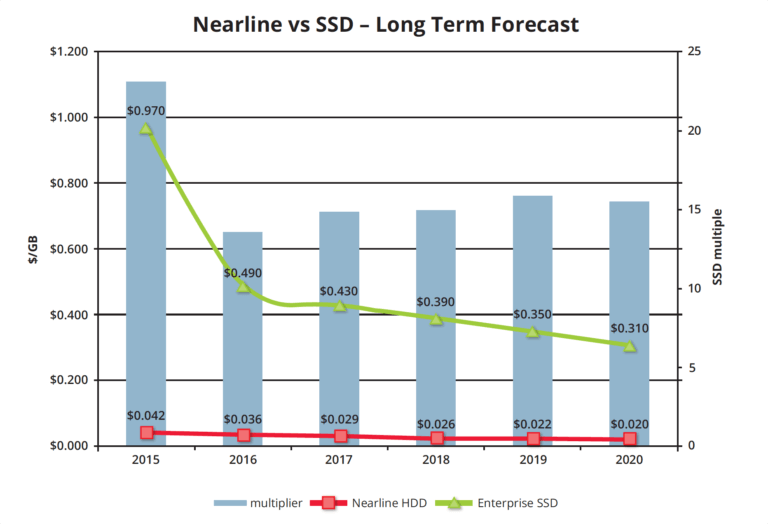 And so, while the gap between SSD and near-line SAS drives is still huge and is expected to be huge into the future, they view the comparison as irrelevant. conventional thinking upside down. By using intelligent software engineering, we save our customers huge amounts of cash – all while delivering array densities like the Hyperscalers (Google, Amazon, Facebook), performance that exceeds that of All-Flash Arrays, and 7-9s of reliability. How do we do it? Our engineers are the holders of a hundred or so software patents that serve to de-couple performance and reliability from the underlying persistent media. While utilizing only 3% SSD and 97% extremely low cost, near-line NL-SAS drives, our flagship InfiniBox arrays routinely smack around expensive, All-Flash Arrays in both performance and reliability. however, they will do so at the expense of media endurance. By moving from eMLC (4 states per cell) to TLC (8 states per cell), PE cycles decreased by a factor of 10 (30,000 to 3,000). And predictions for next-gen QLC chips suggest that trend will continue. That translates to higher failure rates and more cost to the storage vendor to fulfill warranties to their customer base, further eroding their profits. In a recent article on the Data Machine website, the author made an important observation that profitability of companies selling All-Flash Arrays is exceedingly rare. 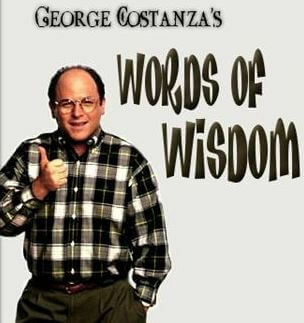 Perhaps instead of spinning the facts and investing lots of marketing dollars to make a case for the extremely expensive, all-flash data center, companies should put their money to better use by developing products that deliver what their customers truly want – high value, low-cost storage that enables their businesses to thrive. datacenter ignore these facts? I think we all know the answer to that.